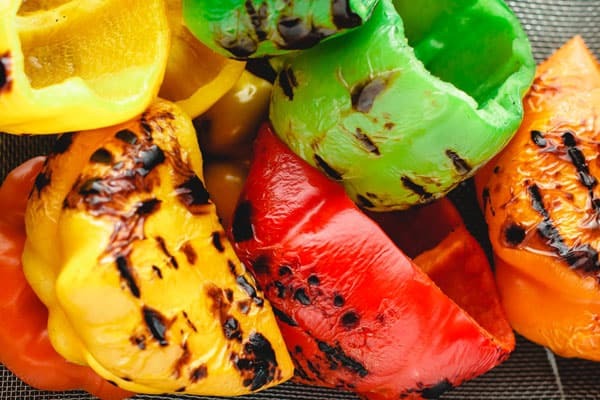 Colorful bell peppers are the perfect vessel for a variety of stuffing options. 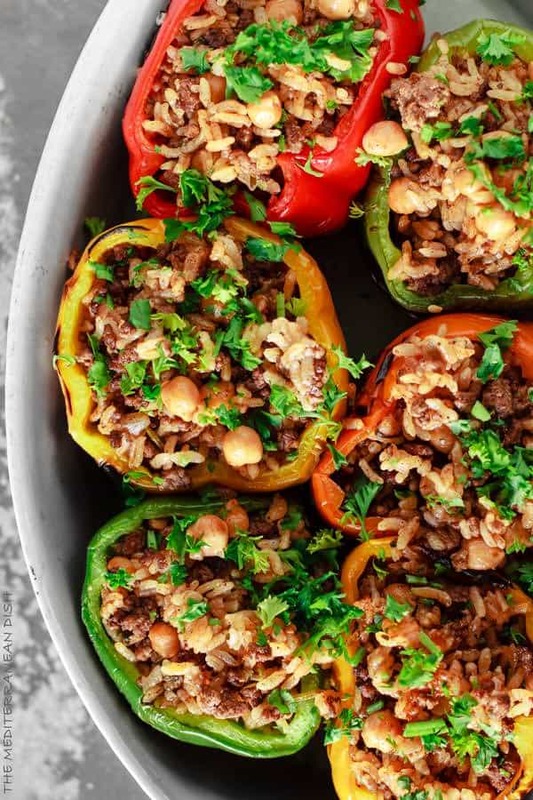 You’ll love the Mediterranean twist this stuffed peppers recipe takes! The secret is in the rice stuffing with perfectly seasoned lean ground beef (or turkey), chickpeas, and fresh parsley. These healthy stuffed peppers are dairy free and gluten free. They can be the main course with a side salad, or wow dish for when you have company! Best part, you can prepare these ahead of time! Be sure to check out all the tips along with the step-by-step tutorial and video below. We’re obsessed with stuffing all the vegetables over here! In fact, stuffed vegetables are their very own class within Mediterranean cooking. Have you seen these options: Stuffed zucchini. Stuffed cabbage rolls. Stuffed eggplant? Topping this list today is one of my absolute favorites: Mediterranean-style stuffed peppers. My mom’s signature stuffed peppers recipe is one of those classic comfort foods I have always loved. I’ve adapted her recipe with a few of my own tweaks here. 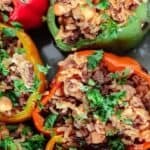 How to Make these Stuffed Peppers? 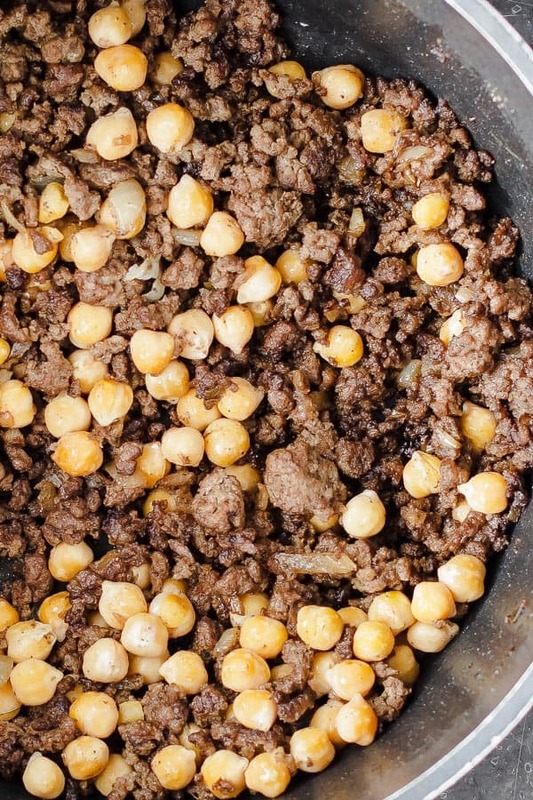 1- This recipe is all about the tasty Mediterranean-style rice stuffing with perfectly spiced ground beef and chickpeas. We start by fully browning the meat with chopped onions, adding the chickpeas later (Yes, you can use ground turkey or chicken instead of beef). Seasoning the meat is essential, and little hint of ground allspice makes all the difference in flavor. 2- To the meat and chickpea mixture, we add rice. (I like to soak my rice in water for a few minutes to help it cook evenly and quickly.) Continuing to add flavor, we throw in some fresh parsley, paprika and tomato sauce. Of course, we need liquid to cook the rice stuffing. I simply use water. Bring to a boil to reduce by 1/2 before turning the heat to low. Then, we cover and let everything cook for about 20 minutes or so. Then spoon in the stuffing to fill each pepper up (the stuffing is cooked already, so need to leave too much room for expansion.) Cover tightly and bake for 25 to 30 minutes. Then garnish with a little fresh parsley before serving. Can these stuffed peppers be prepared ahead of time? 1. You can full prepare and cook the rice stuffing, and prep and grill the peppers. Store each separately in tight lid containers in the fridge. And when ready, stuff the peppers and follow baking instructions. It’s best if you can pull the rice and peppers out of the fridge to rest at room temperature for a few minutes before baking. 2. You can follow the recipe most of the way and assemble the peppers in your baking dish and stuff them. However, do not add liquid to the baking dish yet. Instead, cover tightly and store in fridge for up to one night. When ready, bring to room temperature, add the liquid and follow baking instructions. For special dinner parties, these stuffed peppers make a beautiful centerpiece. I’d plan on 1/2 to 1 stuffed pepper per person, if you’re serving alongside other options. To serve these stuffed peppers the main course for a light meal, plan on 1 full pepper to 1 1/2 pepper per person (I’ve had some big guys who needed 2.) Add a side of Greek tzatziki sauce or plain Greek yogurt along with a salad like, fattoush, Greek salad, or this simple 3-ingredient Mediterranean salad. My family will often enjoy a Mezze platter like this one to start with. 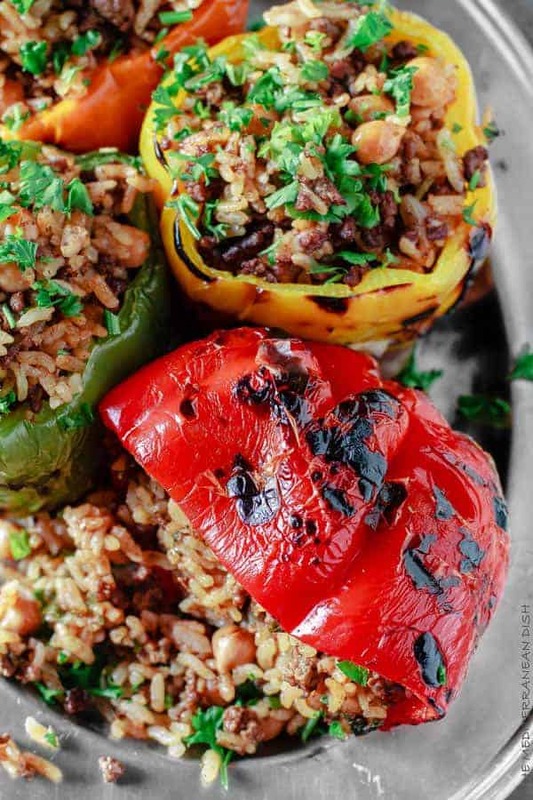 Healthy, Mediterranean-style stuffed peppers. 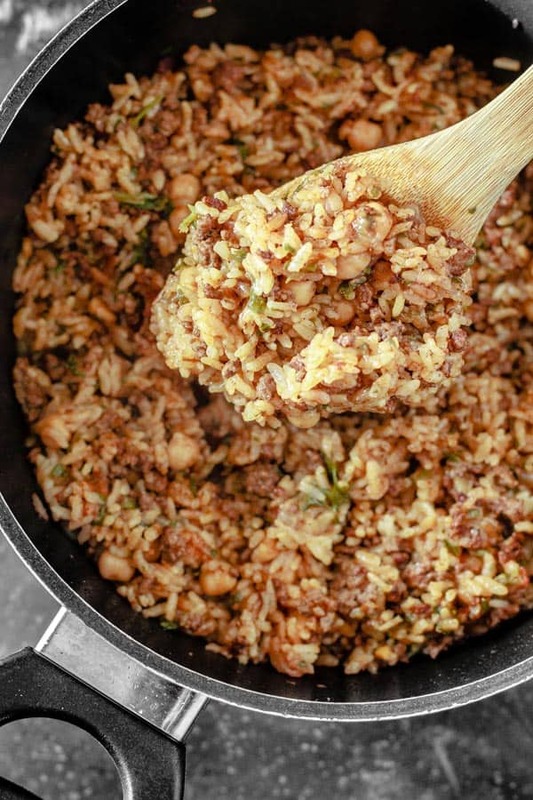 The secret is in the rice stuffing with perfectly spiced lean ground beef, chickpeas, and fresh parsley. You can even use ground turkey or chicken instead, if you like. These stuffed peppers can be prepared ahead. Be sure to look through the tutorial and watch the video! In a medium heavy pot, heat 1 tbsp of oil. Saute the chopped onions until golden. Now add the meat and cook on medium-high heat, stirring occasionally, until deeply browned. Season with salt, pepper, allspice and garlic powder. Stir in the chickpeas and cook briefly. 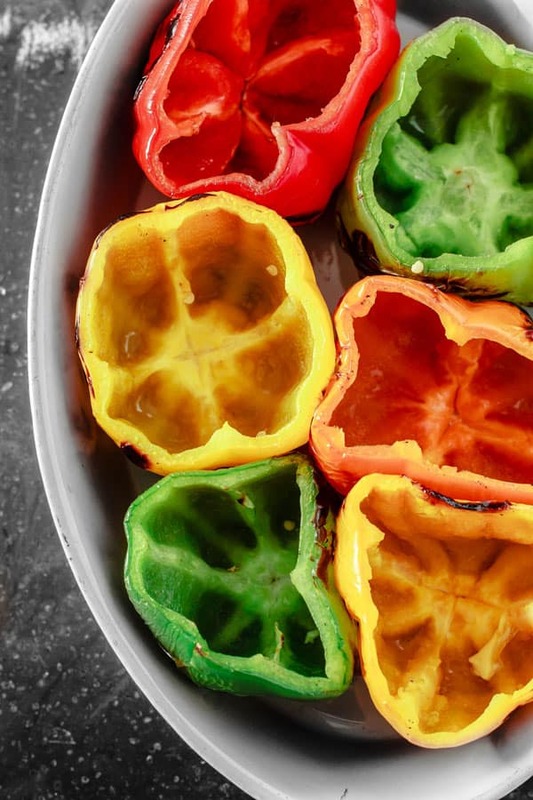 Assemble the bell peppers, open-side up, in a baking dish filled with 3/4 cup broth or water. Spoon in the cooked rice mixture to stuff each of the peppers to the very top. Pro-Tip: If you’re looking for an even healthier option, substitute the lean ground beef for ground turkey or chicken. Cook’s Tip to Prepare ahead: you can follow the recipe up to step # 3 to prepare the rice. And you can also prepare the peppers. Store each separately in tight lid containers in the fridge. OR, follow the recipe up to step #6 assembling the stuffed peppers in a baking dish. However, do not add liquid. Instead, cover tightly and store in fridge. When ready, bring to room temperature, add liquid and bake at 350 F as instructed. Recommended for this recipe Our Private Reserve Extra Virgin Olive oil. And from our all-natural spice collection, Allspice and Sweet Spanish Paprika. Visit The Mediterranean Dish store here. 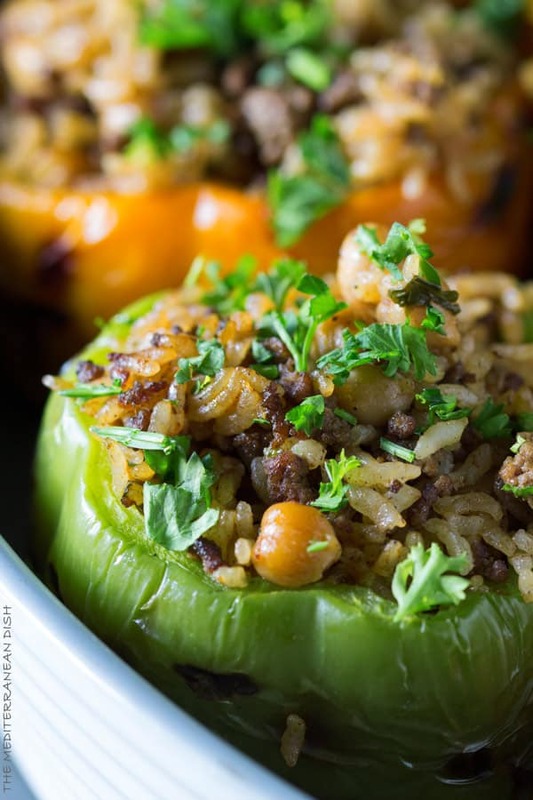 Love the combination of ground beef and chickpeas in these stuffed peppers. Yum! Awesome! Hope you give it a try soon! So flavorful and delicious! Love this recipe! Thanks so much, Taylor! So glad you enjoyed it! Can not wait to make this recipe for the holidays, thank you for sharing! 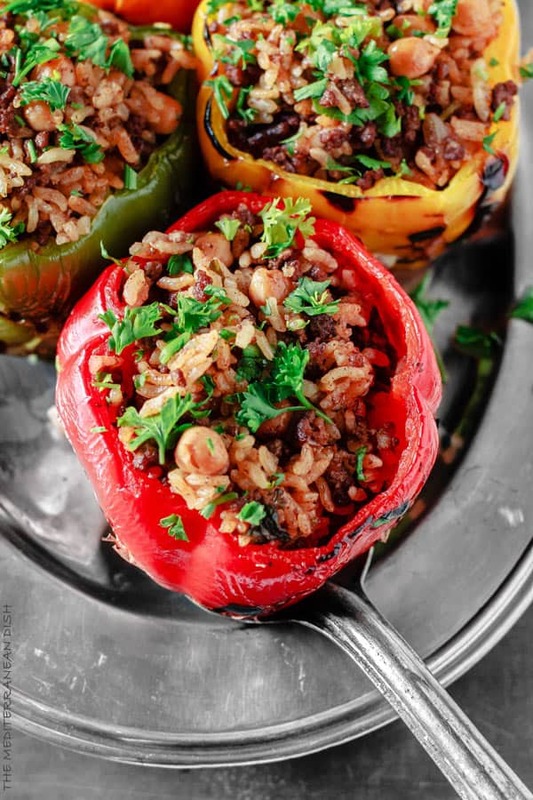 These stuffed peppers look like the perfect yummy cozy dinner! Love the addition of chickpeas in these. I can’t wait to make these stuffed peppers! They look so delicious! I could eat these every week for the rest of my life, they’re the perfect comfort food! Oh me too, Sue! love stuffed peppers! I didn’t have chick peas, and I also added Kalamata olives and feta cheese. Yummy! Thanks for sharing your variation, Judy! Glad you enjoyed it! I’ve never cooked with sweet or hot paprika. Does using hot paprika make it a spicy dish? I just made this again, and changed a bit. I used quorn meatless crumbles instead of beef, used the entire can of chickpeas plus the aquafaba, added roasted garlic, did half sweet and half hot paprika, added 6 diced cremini mushrooms, added about a quarter cup extra rice (it was the very end of the container and I didn’t want to keep just a fourth of a cup in the container), added a little bit extra of the spices (they were heaping spoonfuls), and added half a cup of red wine to the broth mixture I used to cook the rice. It smells amazing! I also used two tablespoons of tomato paste instead of sauce. Oh, and I used special saffron sea salt instead of table salt! It adds a lovely hint of extra depth. The biggest impact of the recipe is the allspice, I think! Your recipe was the first time I’d ever used it in a savory dish! Oh, and my rice wasn’t quite done after 20 minutes, so I added a cup of vegetable broth (low sodium) and simmered it for another 10 minutes. Ellie, thank you so much for sharing! You stated ” And there are a couple of ways that you can prepare it ahead, if you like (see the recipe notes).” But I was unable to find any recipe notes. Joleen, thanks for catching that! Prepare ahead instructions are now listed in recipe notes. I am simmering the rice mixture right now and it smells divine! I added a couple spoonfuls of fresh chopped basil instead of parsley because I don’t have any handy. I’m a pescatarian, so I’m using Boca faux-beef crumbles in place of the beef. Very excited to try it tonight! I don’t have access to a grill though; can I just sautée the peppers on medium-high heat in a pan on the stovetop? I’m going to assume I can and do that. Hi Ellie! I’m excited for you to try this! And glad you’re tailoring it to your needs. Grilling the peppers isn’t essential, you can absolutely sautee them briefly in a skillet with a little bit of olive oil. The idea is to soften them just a bit. Enjoy! Glad to hear it, Marylin! Thank you! peppers these are way tastier. Awesome, Cindy! So glad you enjoyed these! Really tasty, just I underestimated the prep a little… but absolutely delish! Thanks! Awesome, Sinead! Glad you enjoyed it. With a little practice, the prep gets easier/quicker. This recipe was totally delicios! I prepared it last night and I must say, me and my boyfriend truly loved it. Thank you very much for the recipe! Wonderful, Andrea! I am so glad you enjoyed it. Thank you so much for taking the time to share. This looks simply delicious! I am huge fan of stuffed peppers and the addition of the chickpeas really sells me on your version. Looking forward to trying them out! It really is, Beth! Hope you give it a try! I have such comforting memories of stuffed peppers! What a great recipe. I love that you added chickpeas. Looks fabulous! These look absolutely beautiful and delicious! I love the beautiful markings on the peppers. I am definitely going to have to try this recipe soon. Thank you for sharing! I love stuffed peppers! These look amazing! Me too! Thank you, Deanna! We love stuffed peppers and they are a great way to use up leftovers. We sprinkle some feta on ours too. Sure, feta would be a great addition here, Dannii! Thanks for sharing.